Due to the STATE OF THE UNION address, only one network aired original programming after 9PM. 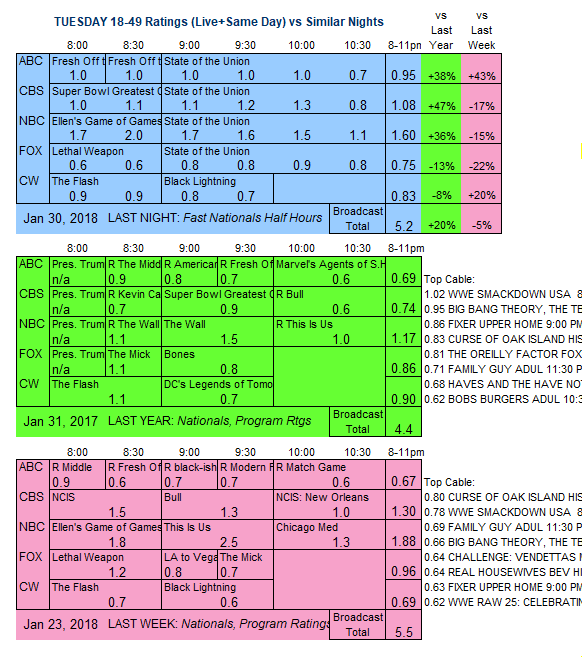 ABC: Back-to-back FRESH OFF THE BOAT episodes at 1.0/1.0 were steady with the last new half-hour on January 16. CBS: The SUPER BOWL GREATEST COMMERCIALS special was up 0.2 from last year’s edition to 1.1. NBC: ELLEN’S GAME OF GAMES easily won the night with a steady 1.8. NBC also had bragging rights to the STATE OF THE UNION coverage at 1.5. 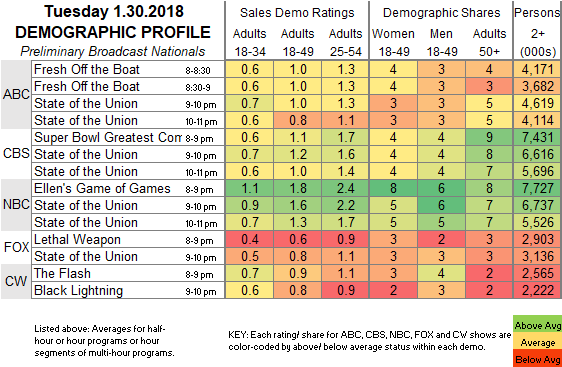 FOX: The chart doesn’t indicate it, but the LETHAL WEAPON episode was a rerun at 0.6. CW: Even on an atypical night, the network must be relieved that both THE FLASH (0.9) and BLACK LIGHTNING (0.8) were up 0.2 from last week. ABC’s sitcoms are in rerun mode tonight. On cable, Syfy airs the season finale of the already-renewed HAPPY.